On her debut, the former Dirty Projectors bassist proves herself to be a vital force in contemporary experimental pop music. Throughout Angel Deradoorian’s debut solo release, The Expanding Flower Planet, the only stylistic consistent is her mellifluous, gorgeously malleable voice. Like an even more avant garde, though ultimately less intentionally strident Merrill Garbus, Deradoorian’s songs are built largely around repetitious vocal samples augmented by polyrhythmic percussion, sparse electronics and prominently positioned bass. But rather than relying on vocal distortions bordering on the ugly, Deradoorian’s primary aim is crafting a thing of true beauty set it in an often alien setting. 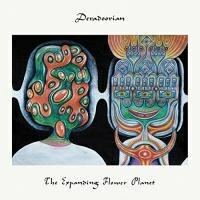 Having spent time in Dirty Projectors and Avey Tare’s Slasher Flicks, Deradoorian is no stranger to the musical avant garde in terms of both composition and presentation. But where those groups were just that, Deradoorian is largely Angel alone, exploring Western and non-Western notions of composition and song structure, often concurrently, to create something that sounds at once familiar and utterly foreign. But where others might seek to alienate through their atypical approach to composition, Deradoorian relies on the warm, inviting timbre of her voice to draw the listener in. Once hooked, her vocals are then surrounded by a host of world music percussion elements, synths and her rumbling, steadfast bass. Acting largely as an anchor, her bass functions often in direct counterpoint to her multi-octave voice, of which she makes full use. Employing a droning, Krautrock-esque bass figure on opening track “A Beautiful Woman" Deradoorian uses the bass’ repetition of the same note to build a gorgeous descending vocal melody that is augmented by clattering percussion and chiming guitar. It’s a deceptively complex structure that finds her layering her vocals in atypical harmonies, all set against the single-note bass drone. Elsewhere, she touches on the circular minimalism of Terry Riley on “Ouneya". As with “A Beautiful Woman", Deradoorian builds the song piece by piece atop the initial, repetitive figure, creating something truly haunting and beautiful in its odd tonal qualities and abstract percussion. Far more minimalistic than “Beautiful Woman”s lush chorus, it nevertheless adheres to the same basic compositional framework, one which allows for the organic development of the song within a live setting, Deradoorian looping her individual parts to create a one-woman symphony. Throughout The Expanding Flower Planet, Deradoorian employs a host of assorted non-traditional percussion and non-Western scales to create a sound befitting her unique vocal phrasing. While ostensibly pop songs (her credits, in addition to Dirty Projectors and Avey Tare’s Slasher Flicks, include guest spots with U2, Charli XCX and Vampire Weekend, among others) there is a slightly off quality to each; a uniqueness that singles out each as decidedly the work of her and no one else. There’s an almost Harry Nilsson-esque quality to her vocal approach, quickly turning phrases, diving and swooping throughout the song with myriad vocal filigrees based more in classical than popular composition. On “Violet Minded” in particular, her phrasing and stacked harmonies call to mind early Nilsson, carrying with it a certain light, playfulness that enjoys playing around with the vocal melody more than simply adhering to its basic outline. And that is the underlying appeal of much of the music here: While certainly serious and thoughtfully composed, there is a lightness, an accessibility throughout that prevents The Expanding Flower Planet from devolving into arty pretension. This is perhaps most evident on the sing-song folk of “Komodo", a song about the titular lizard that sounds medieval, as if phoned in from another time and place far removed from our own. Likewise “Your Creator”s alternately ascending and descending melodic figure feels borrowed from some surrealist cartoon, yet manages a complex hook that lasts for days. It’s within this wildly idiosyncratic, left-of-center approach to pop music that Angel Deradoorian’s appeal lies. While it would be easy to dismiss the album upon first listen, further exploration exposes a rich tapestry of sounds and ideas so dense it could take years to parse them all out, this in spite of their apparent simplicity. Having graduated from both Dirty Projectors and Avey Tare’s Slasher Flicks, The Expanding Flower Planet is a confident declaration of independence from a vital artist operating at the top of her creative game.